Want to keep your hummingbirds visiting often? Then this information is for YOU! The first thing is you’ll need to offer some hummingbird hospitality. Which means providing them with the same services you’d expect in a good hotel: appealing food and drink, and a comfortable place to sleep. Wait a minute, you might say. 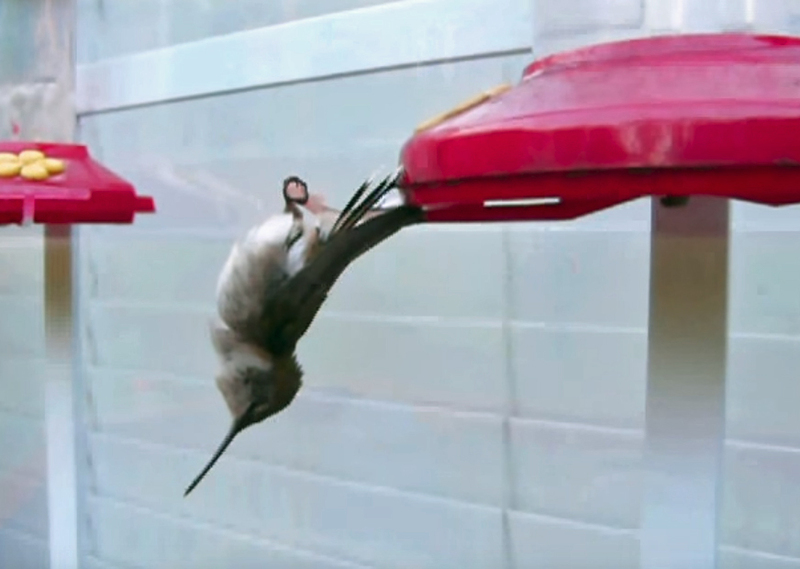 You talk about lodging, but where do hummingbirds sleep? Another key to keeping the hummers visiting your yard often is simply to put out feeders and fill them with sugar solution. You’ve probably heard a fancier name for it: hummingbird nectar, but there’s actually NO such thing! Hummingbirds extract nectar from flowers but NOBODY sells flower nectar. However, the ingredient in the flower nectar that nourishes the hummers is sucrose, which is what white table sugar is made from. All YOU have to do to create a viable substitute is make a solution of 1 part sugar to 4 parts water. 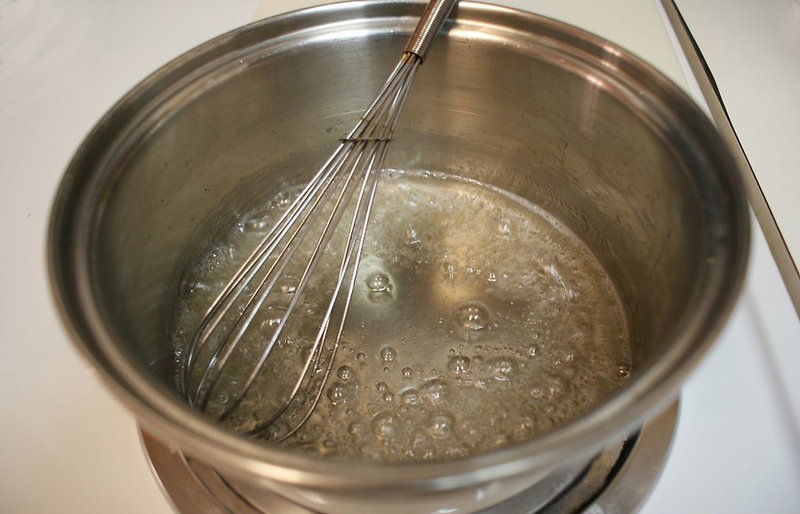 Bring it to a boil to eliminate any bacteria or mold, and when it cools down to room temperature, you’re ready to go. But here are some details to keep in mind: use the PUREST water available and choose a brand of granular white sugar that contains no preservatives or additives (Domino, for example), and DO NOT substitute brown sugar, honey, or any other kind of sugar or sweetener. This is critical. For example, hummingbirds can die from the mold that will start to grow if you substitute honey. You’ll want to change the solution in your feeders every two or three days. If you see no signs of mold or fermentation (odor, or change in the color of the solution) you can get away with doing it less often. But the hotter the weather, the faster the solution will spoil; during very hot spells you might even need to change the solution every day. Before you add your sugar solution to your feeders, RINSE them out thoroughly. At least once a week clean them with some soapy water and a bottle brush; some people use white vinegar. After you’ve filled up your feeders, refrigerate any unused solution; it should last for about a week. Much more importantly your back yard should have value-added appeal in the eyes of your little bejeweled patrons, this is done with the presence of THEIR favorite plants. In a previous article we discussed four such plants: Monarda, Butterfly Bush, Lantana, Zinnia and Fuchsia. 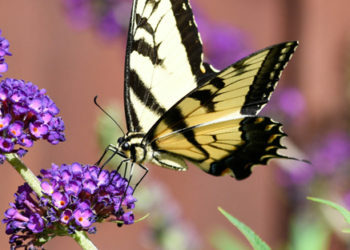 We would also like to suggest Salvia and Sage as additional plants for your hummingbird garden. They will WANT to dine out at these fine nectar-bearing plants and you can be sure that they will appreciate the enhanced ambience those blooms provide in your back yard as much as you do. 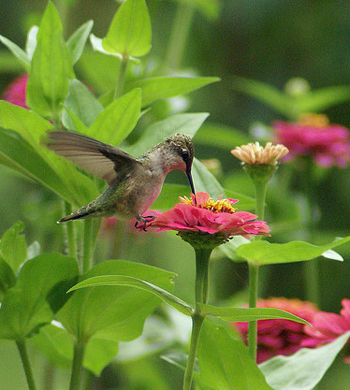 For a list of plants that will bloom ALL season long, read our blog article: The Ultimate Dining Guide for Hummingbirds. Another help in creating the prefect backyard for your hummingbirds is to offer them nesting material. If you don’t have access to a prepackaged supply, they will also use moss, cotton fluffs, bits of willows, soft plant pieces, dryer lint, and leaf hairs. Hummingbirds don’t make reservations, but to see the travel itinerary of the ruby-throated hummers, visit hummingbirds.net. In the meantime, roll out the grass carpet and follow our hummingbird hospitality advice. You may soon find that your back yard has turned into a Hummingbird Hilton. Big thanks to Jeff Costa Rica Photography for the photo of the Green-violet Ears Hummingbird! I will plant flowers that Hummer love instead. I’m very surprised you say to use soapy water. If you don’t rinse it very, very, VERY well, the residue will harm hummers. Stick with the plain white vinegar. Gail, that is a good point, we were assuming folks would rinse as well. Thank you….but I have problems getting them to go to the feeder. I have 2 hummers that are always out. I do have 2 lrg.plants they love.Butterfly bush and coral bush. Is that the reason they will not go to the feeder?? Donna, what do you feed your hummers in the feeder and how long do you leave it in there before changing? ORGANIC SUGAR ONLY _ NO GMO SUGAR!!!!!!!!!!! Critical for the the health and well being of the hummingbird!!! 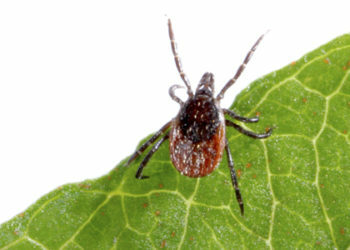 How do you keep the ants from trailing up to the bird feeders besides pesticides? Brenda, does your hummingbird feeder hang from a wire? I’m wondering about the ants as well !! My feeder hangs on a hook off the deck. Can’t keep the ants off. One can also make a water moat out of a Styrofoam cup (if your hummingbird feeder has a wire it hangs from). Cut the cup down so there is about 2-3 inches left. Poke a hole in the middle of the cup bottom run the feeder wire up through it, push the cup all the way down till it sits on top of the feeder, now use a sealant around the hole, let dry, keep filled with water, no more ant problems! I use a little bit of vaseline at the base of the shepherd’s hook or top of feeder to keep the ants off. They won’t cross it. so don’t use red food coloring in the juice for the hummers? That is correct Lela. If you want some color to attract them, tie a red ribbon onto the hanger. I use Pam spray on my hooks! It also keeps the bees and wasps from chasing my hummers away! That is a great tip Elenore. Thanks for sharing it! Plant mint around your home and anywhere to detract ants. Do NOT use oils/petroleum products on feeders or hooks. If the hummers get it on their feathers they can not preen it off and it will harm them. I set up a feeder in my yard over a week ago. No birds yet. I’ve never had a feeder for them. How will they find it AND does central Florida even have hummingbirds?